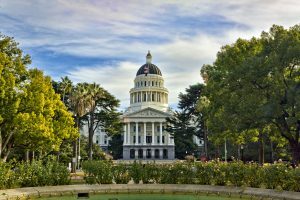 In an effort watched around the world, the California state legislature voted on Monday on a pair of bills that re-commit the state to reducing greenhouse gas emissions and tackling a changing climate. Two-thirds of the legislature, including Democrats from diverse districts and a several Republicans, supported Assembly Bill 398, an extension of the cap-and-trade program, and Assembly Bill 617, a companion air pollution measure. CalCAN supported the cap-and-trade and air pollution package. See our letter here. We did not come to this position lightly. The bills represent a compromise, but we determined, after much consultation with allies and others, that the package of bills advances our fundamental goals of reduced greenhouse gas emissions, investments in innovative climate change solutions that provide multiple environmental, health and economic benefits, and cleaner air. The cap-and-trade program was set to expire in the year 2020 without an extension approved by the legislature and the Governor. Last year, SB 32 and AB 197 passed, which expand the state’s greenhouse gas emission reduction targets to 40 percent below 1990 levels by 2030 and require the California Air Resources Board in its implementation of the targets to avoid the social costs of climate change, including impacts to public health, agricultural production, the economy and more. But not included in last year’s bills was an explicit extension of the cap-and-trade program, which creates the California carbon market. Through this market mechanism, the largest emitters of greenhouse gas emissions – the oil and gas industry, cement plants, food processors and more – are capped and must reduce greenhouse gas emissions over time. What does AB 398 do? AB 398 extends the cap-and-trade program to the year 2030 and includes a number of needed reforms to the program, many of which are in line with the principles we outlined as a coalition this spring. Among those changes to the program is a new requirement for more offset projects to come from California and provide multiple environmental co-benefits in addition to greenhouse gas emission reductions. The bill also reduces the percent of offset credits that can used by any one regulated company under the program to meet their reduction requirements. Both of these improvements to the program should lead to increased benefits for all Californians and provide more resources to deploy in our communities to address climate change and other environmental challenges. AB 398 raised concerns for many community and environmental justice groups for several reasons, including that the bill prohibits local air districts from imposing stricter carbon dioxide emissions regulations on stationary sources such as oil refineries that are regulated under cap-and-trade. However, local air districts retain their ability to regulate stationary sources for toxic air and criteria pollutants as well as short lived climate pollutants (e.g. methane). In another compromise, AB 398 allows for the continuation of some free allowances, the permits to emit greenhouse gas emissions, to regulated entities, including the oil industry. One analysis suggests that additional free allowances to the oil industry would account for roughly 2 percent of the allowances issued from 2020 to 2030. CalCAN supports some allocation of free allowances for food processors regulated under the program, which can will help keep food processors in the state – a critical part of our agricultural and rural economy. Finally, AB 398 establishes new oversight and advisory committees on offsets protocol development, cap-and-trade program performance and just transition issues for workers impacted by the move away from fossil-fuel intensive industries. We believe this will help bring public participation and transparency to the program. What does AB 617 do? The companion measure to the cap-and-trade extension is AB 617, which addresses toxic and criteria air pollution from oil refineries and other stationary sources. AB 617 provides for improved community air monitoring, greater technology improvements to achieve improved air quality and increased fines for violators of air pollution requirements. What about Climate Smart Agriculture Programs? What’s next? AB 398 allows for the continuation of Greenhouse Gas Reduction Fund (GGRF) Investments (aka cap-and-trade auction proceeds) in climate change solutions in our communities. GGRF revenues currently fund a suite of Climate Smart Agriculture programs, which CalCAN has championed, including Healthy Soils, State Water Efficiency and Enhancement Program (SWEEP), Dairy Methane (both digesters and the new Alternative Manure Management Practices Program) and the Sustainable Agricultural Lands Conservation Program. More on these programs here. Importantly, the bill reaffirms that sustainable agricultural solutions to climate change are important and eligible for funding. The bill also allows for investments in climate change adaptation and climate change research, two new areas of funding. This is especially important in light of likely federal cuts to climate change and agriculture research. A separate bill on Greenhouse Gas Reduction Fund investments is anticipated in August, following the summer legislative recess. CalCAN will actively engage in the bill discussions to ensure that important investments made in organic and sustainable agriculture continue and grow. Assemblymember Cecilia Aguiar-Curry (D-Winters) championed the need to support sustainable agricultural solutions to climate change, citing the leadership and innovation of many farmers in her district. We couldn’t agree more. We will be working with her office and others to make our case for on-going support for these critical programs.